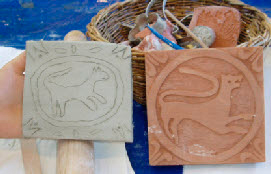 Kate and Charlie visit and bring things to look at, to handle, pass round, smell, feel, try on and to use to make things – everything from Tudor soap to a Tudor House panel. Kate visits your school and helps the children to learn the skills they would need to live as a part of a Tudor household, whether that is dance, spinning wool, working in the Still Room using fragrant herbs, or writing using a quill pen. By the end of Kate’s visit, your children will be able to choose which Tudor trade they would like to be apprenticed to and whether that brings them wealth and prosperity or a cold day out in the fields. 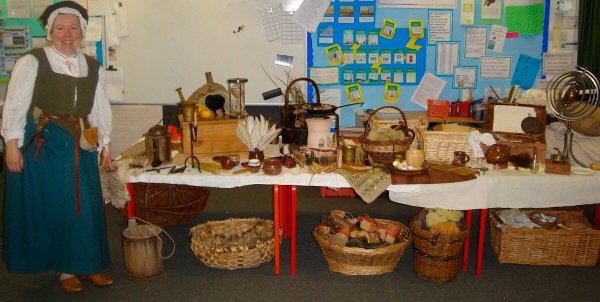 Bringing Tudor clothes to try on and many replica artefacts to handle, smell and use, this is a full, fun packed day of experience, which will leave all the surrounding classrooms jealous as they hear and smell what a wonderful day your class is having! The children will have many items to keep and collect as a memory of the day, which they can put in their journals, and the teachers keep a unique cross-curricular resource pack, to help develop the day further. 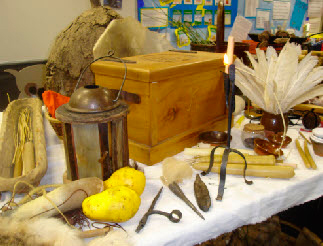 Rich and poor ways of lighting a home, grinding oats with a quern, writing and scented soap balls – made during the day and kept by the children. 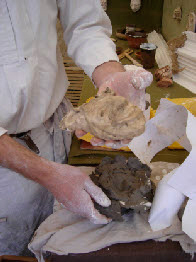 This is an exciting ‘hands on’ experience of Tudor life brought to you through the fabric of their buildings – Mud, Plaster, Stone and Wood. Charlie explains how buildings are made in Tudor times, from the poorest hovel made of dirt to how Henry the Eighth’s richest palace was decorated. 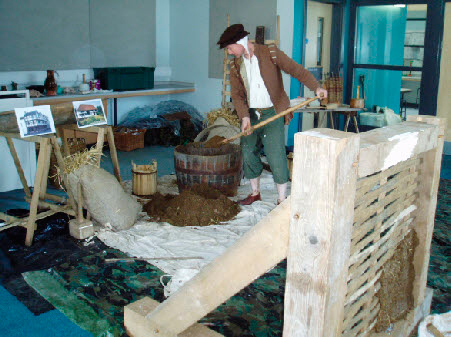 What is best about Charlie’s visit is that the children in class can help make the hovel wall, and can make Tudor decorated plaster, which they can keep to take home. Tudor buildings tell us a lot about the people who lived in them – learn how the Tudors used Science, Technology and Mathematics to construct their homes, palaces and churches and then try it for yourself. Learn about Tudor society though the lives and work of Architects, Masons and Builders and their clients, including Bess of Hardwick and Queen Elizabeth I.
Charlie and Kate also visit schools and run Medieval days, including sacred geometry and Cathedral building in stone and plaster, and Medieval Tile making, as well as a selection of activities which could include a Medieval Illuminated lettering workshop, depending on the age range of the children and suitability for your class. Kate began taking part in the Tudor living history re-enactment at Kentwell Hall in 1988 and has been visiting schools as a Tudor since 2001. Charlie has been a historic buildings conservator since 1997 and first demonstrated building techniques in 2000, developing building for schools in 2007. Each of us is available independently, or together, according to your budget and requirements. Our history days are also suitable for children with special needs – please ask about our previous experiences in schools.